TeamSnap uses mobile push notifications to deliver messages in a snap! A push notification is a message that pops up on a user's mobile device and will only appear if the recipient has the iOS or Android TeamSnap mobile app installed and push notifications enabled on their device and in the TeamSnap app for the specific type of notification. While similar to text messages, Push Notifications are in-app messages and are not delivered by SMS text. When are push notifications sent? Under Mobile Notifications, tap to toggle switch your preferences - possible options depending on the team plan level are Alerts and Schedule Updates, Live! Score Updates, Live! Game/Event Messages, Team Chat Messages. 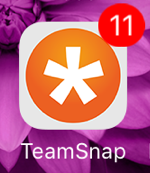 Now, whenever you receive TeamSnap alerts a small red badge marker will be displayed on the TeamSnap app icon indicating that you have new unread information. Note: The red badge marker on iOS devices is ONLY displayed when you receive an Alert messages sent from the Messages tab. It will not be displayed for score updates, new email messages, posts, team chats, availability reminders, event or game creation or updates. Note: Badge markers for Push Notifications will only be displayed on TeamSnap app icon for Android Devices using Android Oreo 8.0 or higher as this is not supported is earlier Android versions. If you do not see the TeamSnap app in your phone’s Notifications settings, you may not have given the app permission to send notifications the first time you downloaded it. To fix this, please delete the app, then download it again.